Searching for the legendary invisible Fenri, SG-1 gates to P3X-774 where they encounter Apophis, also seeking the creature. 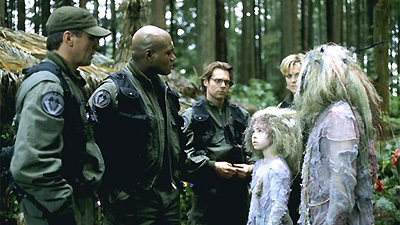 In an ambush, SG-1 is killed, only to be revived by the Nox, the whimsical fairy-like inhabitants with mystical powers. It is they who make the Fenri invisible, and they can revive the dead. However, the peaceful people refuse to accept SG-1's offer of help to defend against the threat of the Goa'uld. For appearances can be deceiving, and the Nox reveal that their simple ways are far beyond either the Goa'uld or the "young" people of Earth. Secretary of Defense David Swift visited the facility to observe the deployment of SG-5 to P3C-117. To this point, SGC has visited 19 separate worlds. Both the Goa'uld and SGC have a homing device to locate the stargate if separated from it. Fenri is a large flying creature native to the planet believed to have powers of invisibility. Teal'c was once ordered to retrieve the fenri for Apophis but failed and lost 2 men as punishment. Shak'l served under Teal'c when he was First Prime of Apophis. Apophis has acquired a personal force field shield, the power of which is proportional to the velocity used against it. Dal Shakka Mel: "I die free." Ohper, among the oldest of the Nox, is 432 years old. The Nox possess a level of technology far above Earth and the Goa'uld, including the ability to control molecular structure at will, creating the effect of invisibility, and the ability to create floating cities that defy gravity. The Ritual of Life is a ceremony in which the dead can be revived. During the ceremony, the Nox are unable to maintain invisibility. The Nox intend to bury the stargate, making return impossible. Wasn't I just killed? Killed as in... dead?